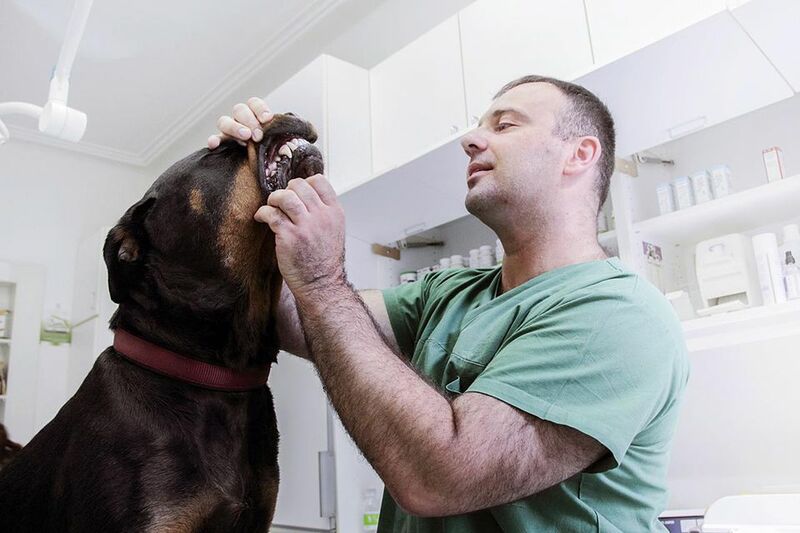 Does Your Dog Have Periodontal Disease? Periodontal disease is characterized by inflammation of the tissues surrounding a tooth (essentially, the tooth's support system). It can affect as little as one or two teeth or as much as a dog's whole mouth. It may only affect the gums at first, but will eventually affect the bone around the tooth roots. Left untreated, periodontal disease can lead to severe oral pain, loss of teeth, other dental diseases, and a wide array of complications throughout the body. Proper dental care can prevent periodontal disease and is an important aspect of keeping your dog healthy. The development of periodontal disease is a gradual process that begins with the formation of plaque on the teeth. Bacteria in the mouth form this plaque, which is a bacterial film that adheres to the teeth. Next, minerals in the saliva harden the plaque into dental tartar (calculus), which becomes firmly attached to teeth. The plaque and tartar, both of which contain bacteria, spread under the gum line. The bacteria secrete toxins and cause damage to the supporting tissues around the tooth, including the gum and bone. This damage creates a pocket around the tooth where more bacteria and debris can collect. Certain dogs seem to have a genetic predisposition to periodontal disease. This often relates to the dog's breed. Many small breed dogs, such as Dachshunds and Chihuahuas are especially prone to periodontal disease. The signs of periodontal disease vary from dog to dog and are typically based on the severity of the disease. The first thing most people will notice is halitosis. Contrary to what many people believe, dogs are not supposed to have bad breath. This is a sign of dental disease and it should be addressed right away. Dogs with advanced periodontal disease tend to have especially foul breath. As periodontal disease progresses, so does oral pain. Be aware that not all dog will show that they are in pain; many dogs try to hide their pain until it is unbearable. If they do show their pain, they may become reluctant or unable to chew food and treats. Dogs with oral pain may also lose interest in chew toys. They may begin to salivate more than usual. This saliva may even be blood-tinged. Upon closer inspection of the teeth, you or your vet will notice gingivitis (inflammation/reddening of the gums) at the very least. As periodontal disease advances, teeth will eventually become loose. Periodontal disease is diagnosed and numbered from one to four (based on severity). In the mouth, periodontal disease causes damage to the gum tissue and bone around the teeth, leading to loss of these tissues. Periodontal disease can also cause other problems to occur in the mouth. It is important to understand that periodontal disease can lead to other major health problems throughout the body. Tartar build-up and gingivitis start in the early stages of dental disease. These can be cured with a professional dental cleaning, home care, and a little healing time. However, there is no cure for periodontal disease. Once dental disease progresses to periodontal disease, the bone surrounding the teeth begins to destruct. This bone loss cannot be undone. Fortunately, it can be treated to slow the progression of the periodontal disease. No matter the grade of periodontal disease, the first and most important treatment step is professional dental cleaning. This procedure must be done under general anesthesia. Veterinarians and veterinary technicians can get a better look at the teeth and accurately assess the stage of the disease. Many vet offices​ perform digital dental x-rays, which are extremely valuable when it comes to making an accurate diagnosis and treating accordingly. Thorough scaling of the teeth can be done during a professional cleaning, including the subgingival surfaces of the teeth (under the gum). Be cautious when it comes to "anesthesia-free dentistry." This procedure may help improve the look of teeth and possibly reduce bad breath, but it is not a thorough periodontal cleaning. A true professional cleaning cannot be done if the pet is awake, no matter how well-behaved that pet may be. Once your dog's teeth are clean, your job begins. The goal now is to slow down the progression of periodontal disease. Home dental care is essential for all dogs, but it is even more important for dogs with existing periodontal disease. The "gold standard" is to brush your dog's teeth daily with an enzymatic toothpaste made especially for pets. Daily brushing may or may not be a realistic option for you and your dog. As an alternative to daily brushing, you can try simply applying toothpaste to the dog's teeth daily. If daily care is still not an option, there are various topical products that can be applied periodically (usually once a week). In addition, some food and water additives can change the chemistry of the dog's mouth, slowing the buildup of plaque and tartar. You may also be able to find a canine dental chew that prevents tartar buildup. Just make sure it's safe for your dog. Be aware that not all dog dental products are created equal. Talk to your vet about products that have been proven effective and safe. You can also check out the Veterinary Oral Health Council for a list of approved products. The VOHC is similar to the American Dental Association, but for pets. The best time to start a dental home care routine for your dog is the minute you bring him into your life. This will get your dog used to the process so it's not a struggle. It will also help prevent periodontal disease from starting in the first place. As with most diseases, prevention is key.